Now, it's not strange that one MXF video with 2, 4, 8 or more audio tracks. It's easy to merge and combine all audio into 1 track with most converters. But as to preserve and get the separate tracks, quite a few guys feel unprepared and lack an efficient solution. For the latter one, a workflow to export separate audio tracks from MXF when converting multichannel MXF to ProRes may be very useful for FCP editing. "I'm converting PMW-200 MXF files to pro res but it seems to be merging the audio channels when converting, even if I select 5.1 in the audio settings. I really need the separate tracks in FCP as I want to isolate the radio mic." At present, most conversion tool will automatically combine all tracks into 1 track when converting Multitrack MXF to FCP. A converter, which can not deal with multichannel project, becomes more and more powerless. In the case, Aunsoft TransMXF Pro for Mac is the only completely multichannel MXF solution to preserve, export and preserve multiple audio streams from original MXF. For instance, if your MXF with track 1 and track 2 which recorded by different mics and you need separate audio Tracks 1 and 2 in FCP, the Pro can easily convert MXF to Pro Res with 2 separate channels of audio. Actually, no matter MXF footages from Panasonic P2, Canon or Sony camcorders are recorded with 2, 4, 8 or more audio tracks, the TransMXF Pro for Mac can handle it easily. 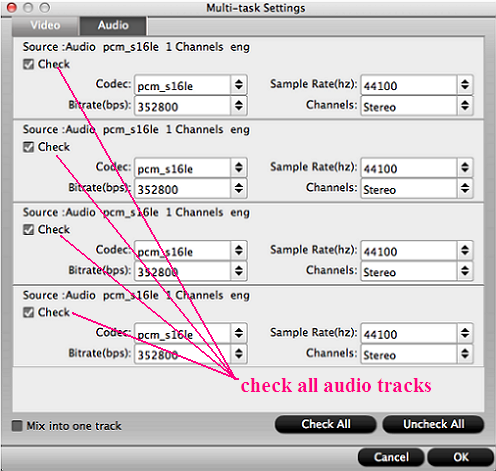 Below is a simple tutorial to convert multi-stream MXF to Pro Res for getting separate audio tracks in FCP. With the advanced audio and video synchronization technology, the output file will with video and audio in perfect sync. 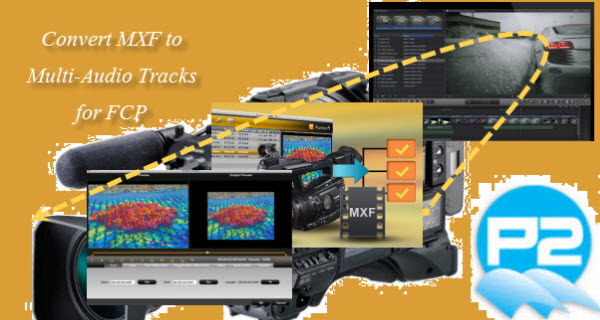 Apart from multi-track MOV, you can also convert MXF to MKV and MP4 with 2 channels, 4 channels, 8 channels or all audio tracks from source MXF. Click "settings" to preserve separate audio tracks in original MXF. The screenshot shows 4 tracks of audio, if your source MXF with 2 tracks, you will get 2 channels here. You have more choices, if you don’t want to keep all audio tracks, you can uncheck undesired ones. And you also can mix multi-audio tracks into individual track. Click "Start Conversion" icon, TransMXF Pro for Mac will convert MXF to RroRes with separate audio channels. You can preview output file when conversion completed.